I'm very excited to start a monthly saints spotlight called "The Church Triumphant," and I couldn't be more pleased about this project. :) As ever, these posts will feature information from our faith, but also from my personal life story. I'd thought I'd start with a fiercely protective saint, St. Michael, and he has a lot of significance in my family, as I'll explain below. 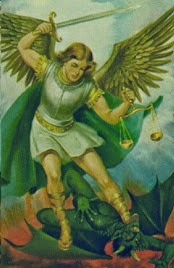 St. Michael is an archangel, and was the leader in the heavenly battle between the good angels and Satan. He is mentioned in Scripture as being one of the "chief princes," and his name means "He who is like God." For centuries, he has been known as the defender and protector of the Church, and his feast is celebrated on September 29th. Ok, so how does St. Michael fit into my life? Well, "Michael" has always been a significant name in my life. I actually dated two other Mikes before I found my husband (*gentle snort* third one is a charm!) and my Mike has an interesting relationship with his own name. His dad's middle name is Michael, but yet everyone calls *him* "Mike." Strange, kinda? So people often think that my Mike is a "Jr" which he is not. But anyway, aside from that one snafu, Mike likes his name, and in fact chose. St. Michael as his confirmation saint. Since he does not consider himself an active Catholic as an adult, I have always looked to St. Michael as being on my side to lassoing him back. ;-) Thus, I include St. Michael in my list of intercessors frequently. Henry too, is fascinated by St. Michael. I mean, look at the picture from the perspective of a young boy. Cool, right?! He HAS A SWORD and is SLAYING AN EVIL CREATURE. This gives him a very high cool quotient. Henry has a small statue of St. Michael in his room that he picked out at a Catholic gift shop, and often picks out St. Michael holy cards to bring home to Mike. Cute! "St. Michael the Archangel, defend us in battle. Be our protection against the wickedness and snares of the devil. May God rebuke him, we humbly, pray. And do thou, oh Prince of the Heavenly Host, by the power of God, cast into hell Satan, and all the other evil spirits, who prowl about the world seeking the ruin of souls. Amen." I also pray that prayer at the end of every rosary that I recite. It's powerful, no? Does anyone have a devotion to St. Michael? Or another saint you'd like to mention? Leave us a comment! Just a quick housekeeping announcement: I'm taking a few days off to spend a long weekend with Mike and the kids, so no 7 Quick Takes tomorrow, nor a post on Memorial Day. I will return to you next Tuesday with tales of my weekend antics. :) Have a wonderful start of the summer weekend, everyone!